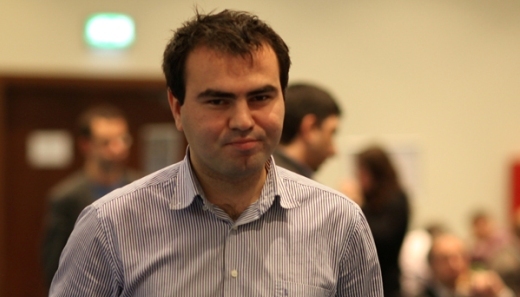 Grandmaster Shakhriyar Mamedyarov from Azerbaijan qualified for the next year’s Candidates Tournament after the conclusion of FIDE Grand Prix series in Paris. Mamedyarov finished second in the overall Grand Prix standings with 390 points. Veselin Topalov qualified earlier with 410 points. The Azeri had to wait with celebration until the end of the Paris tournament, as Alexander Grischuk and Fabiano Caruana still had a mathematical chance of passing him on the standings. For this to happen, Grischuk or Caruana would have to be outright winner of the tournament. Grischuk lost his chances earlier in the middle of the competition, but Caruana was fighting until the very end. The Italian star entered the final round on equal points with former World Championship challenger Boris Gelfand. Caruana, who played black against Leinier Dominguez, had to do better than Gelfand who had white against Ruslan Ponomariov. However, Dominguez didn’t have a great ambition to mess up with the standings and he sacrificed a piece early in the game to force the moves repetition. Continuing the play was too risky and Caruana reluctantly agreed to split the point. At that moment the position in the game Gelfand-Ponomariov was still very complicated, but this didn’t last long as the two soon repeated moves. Mamedyarov was in excellent form this summer, clinching the titles in World Rapid Championship, Geneva Masters and Beijing Grand Prix. Vladimir Kramnik and Dmitry Andreikin from the World Chess Cup 2013, Veselin Topalov and Shakhriyar Mamedyarov from the FIDE Grand Prix, Levon Aronian and Sergey Karjakin on average rating. The player who loses in the 2013 World Chess Championship Match also qualifies. The final spot goes to the player nominated by the Organiser (rated at least 2725 in July 2013). At the present there are two bids for the Candidates Tournament – from Khanty-Mansiysk and Kozloduy.